The pace is picking up and bills and budgets have been moving in the Alaska Legislature. The House passed the HB 286 Operating budget on Monday 4/2 and Senate finance subcommittees have closed out their departments. Senate Finance committee took public testimony from different regions this morning and this afternoon and will continue to hear budget amendments throughout the coming week. The joint House and Senate confirmation hearing for governor’s appointees is scheduled for Tuesday April 10 at 11:00 A.M.
HB 199 Salmon habitat permitting bill has a major new version with the removal of the automatic anadromous classification and other changes. We look forward to public testimony scheduled for tomorrow, Monday and Tuesday in House Fisheries. More details are below and we thank you for your support. Board of Fisheries – Senate Resources (Monday) and House Special Committee on Fisheries (Thursday) interviewed Board of Fisheries candidates Al Cain and Orville Huntington on Thursday. Archived video is archived at the committee links above. The House and Senate joint confirmation hearing for the Governor’s appointees is scheduled for Tuesday April 10 at 11:00 A.M. – see schedule below. HB 199 – Salmon Habitat Permitting – House Fisheries heard an introduction of new version I on Tuesday, then heard the sectional analysis on Thursday. The new version I, summary of changes and sectional analysis are posted on the bill’s documents tab. Public testimony will be heard on Saturday 4/7 beginning at 10:00 A.M. and again on Monday at 6:30 P.M., and Tuesday at 5:30 P.M. Invited testimony is scheduled for Tuesday 4/10 at 10:00 A.M…See schedule below for links to hearings and instructions to testify. 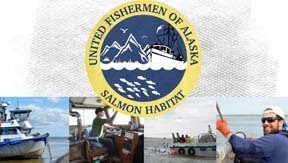 HB 379 Fishermen’s Fund Reimbursement (Ortiz) received a referral to House Finance UFA letter of Support. HB 354 – Dive fishery management (Ortiz) was passed by the House and will be forwarded to the Senate. SB 92 – (CS Posted) An Act relating to abandoned and derelict vessels; relating to the registration of vessels – was passed by Senate Finance committee and is now in Senate Rules awaiting scheduling for floor vote. Meanwhile, the House companion bill HB 386 is scheduled in House Finance Thursday – see below. HB 231 re the Alaska Commercial Fisheries Entry Commission (Administration) was heard, amended and passed in House Fisheries today (Friday April 6).” New documents are posted under the documents tab and the new 3rd version of the bill should soon be available at the Bill Text tab of the bill’s home page… look for CSHB 231(FIN)… Meeting link. HB 76 – Mariculture revolving loan fund and HB 128 – Shellfish Enhancement were both heard and held in Senate Finance on Tuesday (UFA supports both). HB 129 – Fish and Game offense, licenses, and penalties – was heard with public testimony in House Finance Tuesday…and is scheduled for Monday – see below. HB 383 – Tourism Marketing Board -was heard for public testimony and passed by House Special Committee on Arctic Policy, Economic Development and Tourism on Wednesday, and is now in Senate Finance. HB 199 – Salmon Habitat permitting – invited testimony. Presentation: Arctic Transportation & Resources Strategic Plan by Commissioner Andrew Mack, Dept. Compiled by UFA staff and made possible by the support of our Group, Business, Individual and Crew members.